Map showing the township lines of the United States surveys by John Calvin Smith in Ohio, Michigan, Indiana, Illinois, Missouri, Wisconsin, Iowa, Minnesota, Nebraska, and Kansas. 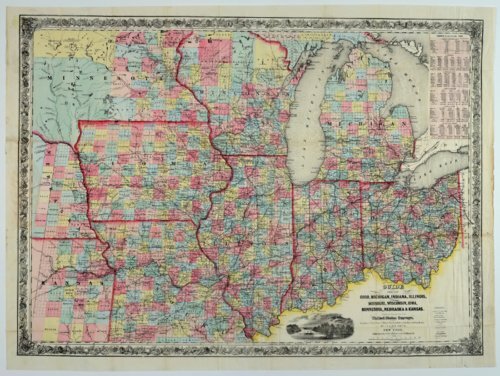 The map has an inset table of census statistics for 1850, including population, number of livestock, principal crops, products, and state finances. This map is provided through a co-operative project between the Lecompton Historical Society and the Kansas Historical Society. Partial funding was provided by the Ross and Margaret Wulfkuhle Charitable Trust and the Freedom's Frontier National Heritage Area. Creator: J. H. Colton & Co.